If you are looking for something that is custom and quick, our Quick Customs are for you! 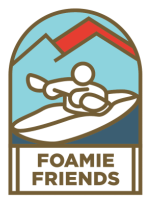 While it normally takes a minimum or 2-3 weeks to make a Custom Foamie, Quick Customs are ready in under a week. I have been stockpiling parts and have enough parts already made where I can assemble something quickly, personalize it, and get it right out to you. We can add a name and phone number to the bottom in case boat gets lost, or add names to sides of boats, as well as can engrave something on bow and stern. Just let us know what you want, and I'll do my best to make it happen. Don't have a week? Just contact me and I'll do my best to meet you deadline and may be able to ship in as little as 24-48 hours. Please remember Quick Customs will be limited to the boat Hulls I have on hand that are listed below.